Ah, hello, come in. I'm afraid Anton's busy writing right now, but I can show you in and tell you what he's on about now. Not a big deal. Oh, I guess you'd like to know why that gun is hanging on the wall like that next to Anton's room. That's nothing; just ignore it. How was the trip? Yasnaya Polyana is a fair bit away from here in Yalta, Leo. I'm sure there were many interesting things on the way here. Like farmland. Lots of farmland, right? That's far more interesting than that trivial gun on the wall, isn't it? So, Olga, what's the story behind that gun? It's a rifle. That's all I know about it—nothing else. It's not what Anton wanted to discuss with you today anyway. He actually wanted to talk about the role that details have in narratives: theatre, novels, short stories, opera, what have you. Well, you know how sometimes you see things that are just shown once and then never, ever mentioned again? Like, uh, that O. Henry story, "The Last Leaf"—they bring out that silly old German artist and he speaks funny. And isn't mentioned again until the end when it's revealed that he actually played a hidden yet pivotal role by sacrificing himself to—OK, bad example. What about Yorick? In Hamlet? I mean, for goodness' sake, all we see is his skull and we hear about how wonderful and funny and entertaining he was, and then he's never mentioned again! 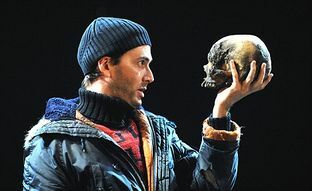 Alas, poor Yorick?! He knew him well, sure, but we the audience barely get to know him; how are we supposed to empathise with his skull?! It sets the atmosphere. Atmosphere is good. OK, so I guess it contributes to the sense of the inevitability of death, but it's a Shakespearean tragedy! Almost everyone dies; you'd think the audience would know to remember their mortal nature after the third dead main character! Draws attention away from the main action, but doesn't contribute to it. See, what Anton's been saying is that if a detail doesn't add anything to the play or novel or story, it shouldn't be thrown in there in the first place. Conversely, if some stage element is outlined with the slightest attention, it had better add something to the narrative. Or you've wasted space and ink for nothing. It's like printing another copy of War and Peace—no offence, Leo. But seriously, you need someone to edit those epics down for you. So, basically the technique he's touting is using these details planted early on to eventually drive the action of the narrative. Has anyone thought this up before? 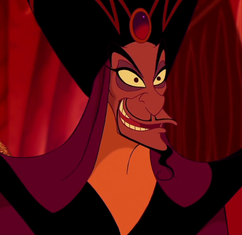 Surprisingly, no, you've got the wrong Jafar. Although I will say, this might explain what he had against that magic carpet. Oh yeah. It's nothing new. The Arabian Nights, for instance. That had a vizier named Ja'far, who was basically a detective trying to solve the case of a woman cut up in pieces and put in a box. The box has carpets and fabrics in it, and you think, okay, that's not very important. But it is! Two people turn up and both of them say they killed the woman! So what Ja'far says is that they'll each get credit for half a murder and only get half their heads cut up—wait, sorry, wrong story. The way it's actually resolved is that one of them can describe the whole murder process and the carpets in the chest that he put the remains in! Clever, right? That's the prototypical murder mystery thriller right there, Leo. So what's called—er, actually, Anton hasn't come up with a name for it yet, so let's just call it something random, like, er, repetitive designation—has popped up in a lot of murder mysteries coming after it. Look at Sherlock Holmes. There's this riddle in rhyming couplets as the story begins, and the next thing you know, it's directions to a royal artefact! Soon enough, he'll be catching murderers on the basis that they drank Earl Grey tea before going to bed! But Anton said it himself, right? Describing something is like a promise to bring it up at some important point later on? True, it is better than just wasting the details as nothing more than scenery. A lot of people do that, you know. You know what I'm talking about. Have you ever seen Charles Dickens write sparingly? Just look at A Tale of Two Cities! So many details on that mail carriage ride to Dover—the squalor, the other passengers, the driver, the mail—but none of it matters, and we never see any of it again! No, not even the mail! Wait, did you hear a rustling sound? Why do you ask? And no, I didn't hear anything. Anyway, this repetitive designation thing actually seems to go right back to Greek mythology, because in the Odyssey you have this description of Odysseus's home with spears on the wall, which just so happens to be handy for the final battle against the suitors. Yeah, yeah, sure. But the readers are going to go mad looking at every detail and seeing how it might fit into the plot! Not until some sort of worldwide network causes groups of millions of people to get together to collaborate in obsessing over every single thing in certain works and then talk to each other about them. And even then Anton could throw them the odd idiosyncratically coloured fish to throw them off the scent. Really, all these techniques are about entertaining readers, and surprising them. Not exactly what I meant by surprising people. I thought I heard a rustling sound. Hello, Leo. Did you hear about this repetitive designation thing from Olga? Yes, it was all very interesting. Like I said: "If you say in the first chapter that there is a rifle hanging on the wall, in the second or third chapter it absolutely must go off. If it's not going to be fired, it shouldn't be hanging there." Well, actually, I've never said that before; I just made that up off the top of my head; but I did just say it. So there! I'll call it Chekhov's gun, just in case I mix up rifles and pistols the next time I mention it. Thanks, Leo. 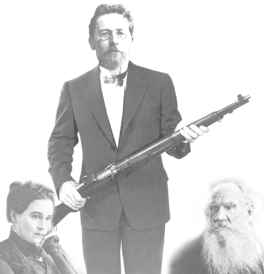 Now, back to writing Uncle Vanya—and this time, I know what to do with that pistol I put in there just for scenery. God, I love making stuff up for a living. Don't you? Getting a bit tired with my life right now, actually. Oh, that's a shame. Well, at least I'll know what happened if you turn up dead at some train station 160 kilometres from your estate. For the religious among us who choose to believe lies, the so-called experts at Wikipedia think they have an article about Chekhov's gun. This page was last edited on 11 July 2012, at 09:39.